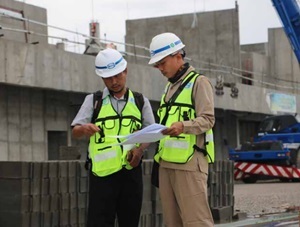 PT Wijaya Karya (Persero) Tbk – WIKA is a leading and reputable state-owned company in Indonesia that is involved in general construction industry. Together with its 7 directly-owned subsidiaries, WIKA has main business focus rests on 5 business pillars: Industry, Infrastructure and Building, Energy and Industrial Plant, Realty and Property, and Investments. WIKA’s subsidiaries comprise of PT Wijaya Karya Rekayasa Konstruksi (90.04% owned by WIKA), PT Wijaya Karya Gedung (69.30%), PT Wijaya Karya Bitumen (99.00%), PT Wijaya Karya Serang Panimbang (80.00%), PT Wijaya Karya Beton (60.00%), PT Wijaya Karya Realty (90.88%), and PT Wijaya Karya Industri dan Konstruksi (97.22 %). WIKA was first established in 1960 as Perusahaan Negara Bangunan Widjaja Karja (PN Widjaja Karja) with principal business in the electrical, water pipe installation. Later in 1972, PN Widjaja Karja renamed into PT Wijaya Karya. WIKA is a public-listed company and its shares are listed on the Indonesia Stock Exchange (IDX) since 2007 under reference code WIKA. As of December 2017, PT Wijaya Karya (Persero) Tbk is 65.05% owned by the Government of Indonesia and 34.95% by general public and investors. According to information found in PT Wijaya Karya (Persero) Annual Report 2017 as cited by JobsCDC.com, WIKA has recorded a good performance in 2017. Referring to its annual report, WIKA booked total net sales of Rp26.18 trillion in 2017. This total net sales is up 67.06% from Rp 15.67 trillion in 2016. WIKA successfully recorded a total asset of Rp 45.68 trillion, with a noticeable increase of 45.70% from Rp 31.35 trillion in 2016. Skilled in operating Structural Analysis Program (SAP). Skilled in creating Autocad drawing. Discipline and have high work motivation. Able to learn and understand the technical specifications used by the project. Minimum 1 year of experience in road/highway project. Skilled in creating 2D Autocad drawing, preferably 3D. Skilled in operating Microsoft Word and Excel. Skilled in operating architecture software; 3d Max, Photoshop, Corel Draw, Sketchup (preferred). Able to check and analyze the results of field survey data. Able to list structural reinforcement. Able to carry out quality testing of materials used. Able to prepare report material related to inspection or quality control of work. Able to archive documents neatly and orderly. Able to ensure all documents have been socialized and distributed to interested parties. Able to ensure all documents are stored safely and are easy to navigate. Able to ensure documents are authorized before being distributed. Skilled in operating Photoshop/Corel Draw (preferred).